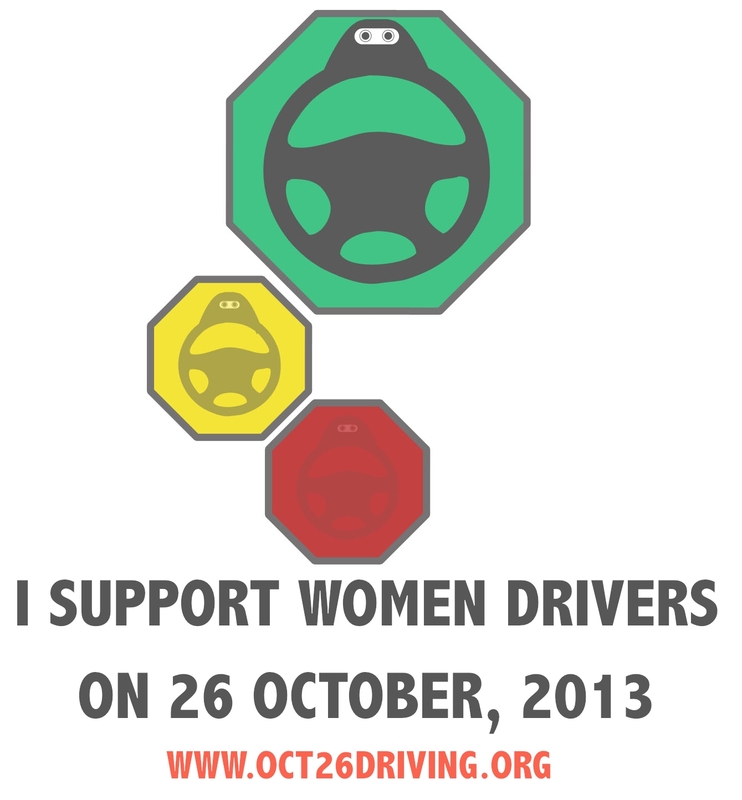 Tomorrow, October 26, 2013, Saudi Arabian women are set to stage a massive protest against the ban on women driving. It is currently the only country in the world in which women are not allowed to drive. FMI, follow Eman Al Nafjan, @Saudiwoman, and Madeha Al Ajroush, @madehaAlajrous on Twitter. Al Nafjan’s YouTube channel has lots of videos posted recently of women defying the ban. One of the videos even shows other cars giving the driver thumbs-ups as they pass by, beginning at about 40s. Dr. Madeha Al Ajroush, who took part in the country’s first protest in 1990, posted a video of herself driving a couple of weeks ago. It is now time for Saudi women to drive. And also society is ready. For how much longer can we live in an oppressive society that prevents us from our full rights. I drove in 1990 to demand my right and now, twenty three years later, we still have not gotten our rights. The website www.oct26driving.com has been widely reported to be a petition that gathered over 15,000 signatures before it was blocked by Saudi authorities. It’s like a person being cut off–they’re legs are cut off and the wheelchair has been taken away from them and you are completely dependent on one gender. Women have to be driven by male relatives or hired drivers, who are “part of an army of imported labor” in Saudi Arabia. Every time I’m in the car with a stranger that hears all my phone conversation, that knows every single detail of my life. He knows what I like. He knows if I had a fight with my husband. He knows everything. It’s worse than the CIA in United States. [laughter] He knows everything about me. I would be relieved and crying and the tears will be about the dedication and the years, and the losses, for such a simple thing–the right to drive. Dr. Madeha Al Ajroush’s name sounds like “Madeeha Allagoosh” or “Madeeha Allagroosh”, and might be easily misspelled as Madiha, Medeeha, or Mediha and Allaghoush, Al Agoosh, Alla Goosh, Allagoush, etc.